Will laser technology be able to make airports drop the 3-1-1 rule? Apparently, there’s a big chance it will. A liquid identifying machine that is vying for an engineering prize may soon eliminate the inconvenience of being forced to follow the 3-1-1 rule in air travel. The 3-1-1 rule requires passengers to limit the amount of liquids they bring to 3.4 ounces, stored in one one-quart container that should be taken out for separate inspection. This rule was imposed as a way of deterring terrorist attacks in planes. Called Insight100, this machine is capable of determining the composition of a liquid by firing a laser beam at a liquid. It can analyze the liquid inside a transparent or partly translucent container with up to three liters of content. No opening is required. The checking will be done by simply using light beamed through the container of the liquid. Insight100 is a creation of British company Cobalt Light Systems. The technology behind it is comparable to what is being used by the pharmaceutical industry in scanning and verifying the drugs being produced and sold. 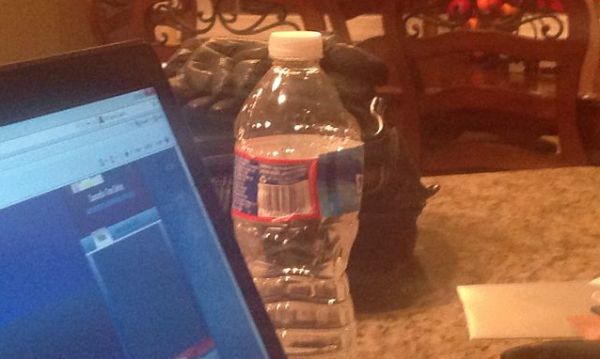 It uses a laser beam aimed at the container to create reactions from the liquid within it. Liquids may appear similar in an x-ray scan but they create varying reactions when exposed to certain intensities and types of light. Insight100 beams a powerful enough laser light to create clearly observable reactions. These light reactions are then cross-checked against a database of liquids considered as threats. The containers, however, should not be metallic. They should either be glass or clear plastic. It can still work with semi-opaque containers although the accuracy will expectedly be diminished. The machine makes use of the Raman Spectroscopy technique and advanced algorithms to find distinctions between reactions on the container and those involving the contents. Within seconds, Insight100 identifies whether or not a particular liquid is threatening. 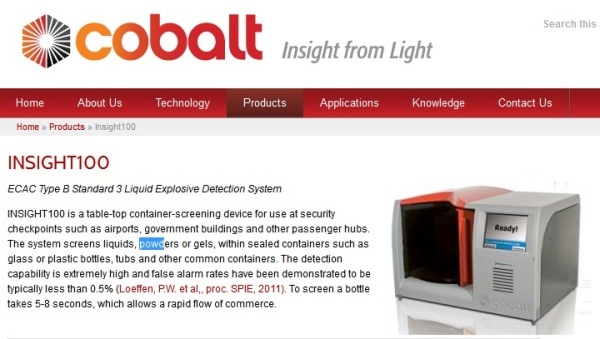 Even better, it can also detect what specific hazardous substance is present in the container scanned. The machine is deemed to have a greater level of reliability in comparison to what current systems are capable of. It is also fast as it only requires around 5 to 8 seconds to scan bottles. Does It Work with Non-Liquids? Insight100 also works with powders and gels. The detection capability is still similar to what can be achieved with liquids. False alarm rates are notably low, at only less than 0.5%. To emphasize, that’s ½ of 1% or 0.005 in decimal form. Unlike other scanners in airports, Insight100 is relatively small. It is a tabletop scanner that can be conveniently positioned in one place and relocated to another depending on the need. It is around twice the size of a microwave oven or approximately as big as an office photocopier. The machine can accommodate for scanning containers of a good range of sizes, from small items such as toothpastes and cosmetics to bigger ones like wines and three-liter bottles of drinks. Insight100 has undergone a number of tests and has been proven to comply with Standard 3 of the European Civil Aviation Conference for Type B Systems. Thus, it can be adopted by airports alongside pre-existing x-ray scanners. Under Standard 3 screening, it no longer becomes necessary to open containers that are suspected to contain dangerous substances. The machine employs a proprietary Spatially Offset Raman Spectroscopy (SORS) system for scanning and has a database that can easily be updated to include information on new threats. Insight100 has already been used by a number of airports across Europe. It has been deployed in more than 60 airports since January,include the United Kingdom’s Heathrow and Gatwick. The makers of Insight100 believe that the machine or the technology behind it can also be applicable in other settings. It can be used for noninvasive breast cancer screening or in diagnosing bone diseases. Hopefully, more airports will start adopting this new scanner. Complying with the 3-1-1 rule is doubtlessly inconvenient. It will be great having a machine that can accurately determine whether or not a container of liquids or powders is safe to be allowed inside an airliner. Indeed, there’s more to laser technology than the weaponry and optical media applications.